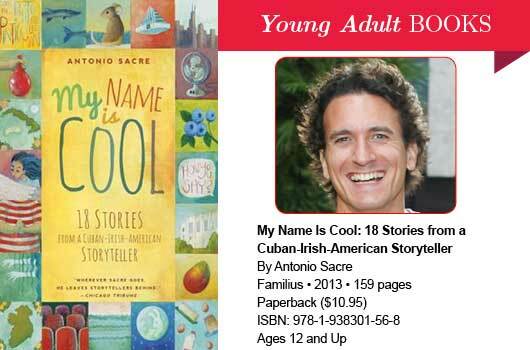 Sacre is a professional storyteller who is part Irish, part Cuban. He has built a storytelling career out of a mixture of personal anecdotes—including his much-exaggerated account of his father’s escape from Castro’s Cuba—and traditional material adapted to his own voice and strengths, including the story of La Llorona, the tale of Country Mouse and the City Mouse, and even the story behind Mexico’s most beloved national symbol, the tale of Juan Diego’s encounter with the Virgin of Guadalupe, all of which appear in this collection. While most of the stories in this volume stand alone, they also feed into one another to create a sort of shadow memoir of Sacre’s life as a member of a loving extended family, a cuentista and, occasionally, a teacher. We learn about Sacre’s struggles with his younger twin brothers, his parents’ divorce, and how his grandmother’s strict tutorials in Spanish and being surrounded by English speakers convinced him to lose his father’s language. Appealing and often humorous, Sacre is a clever narrator. Though the book as a whole is best suited for young adults, parents may want to excerpt sections of it for reading to their younger children. —Reviewed by Cooper Renner, Retired Librarian, El Paso, TX.